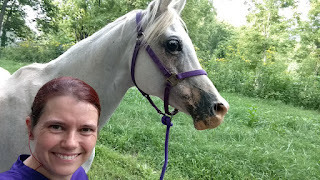 Over the last several weeks, I have been able to ride Sasha consistently longer and faster. Never any hint of heat or swelling on her right front (the cause of her pull at Black Sheep Boogie in June). 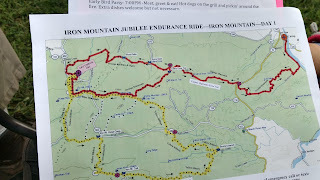 So Wednesday morning, Daniel and I loaded up and headed to Ivanhoe, VA, to participate in the Iron Mountain Jubilee ride. Sasha and I entered the Friday 50 mile ride. This ride is put on by Nancy Sluys, et al, and is a great ride. Last year, we went for the first time and I did the 30 with Sasha. 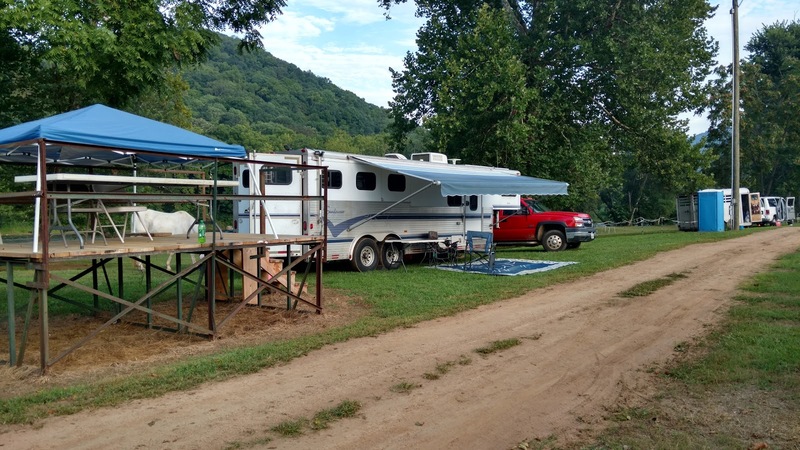 This year, we arrived and Daniel quickly decided to park where we had last year. 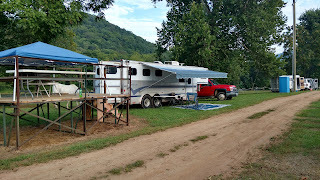 We set up camp and I took Sasha with me on a run along the New River Trail, which the horse camp borders. I don't often get to take Sasha with me on a run. I wasn't sure how it would go as I was just going to jog slowly. Much slower than her preferred trot, but faster than she can walk. I used a rope with a loop at the end rather than hardware so a snap wouldn't smack her under the chin and off we went. A trail head just north of the Ivanhoe Horse Show Grounds. Me and Sasha on our run! Back at camp, I settled Sasha, took a quick shower and ate some supper. Then we headed over to the early arrivals party for some good talk and music. I am in the middle of training for a half marathon and am craving a lot of sleep, so we left just before 9 PM to finish up chores and go to bed. 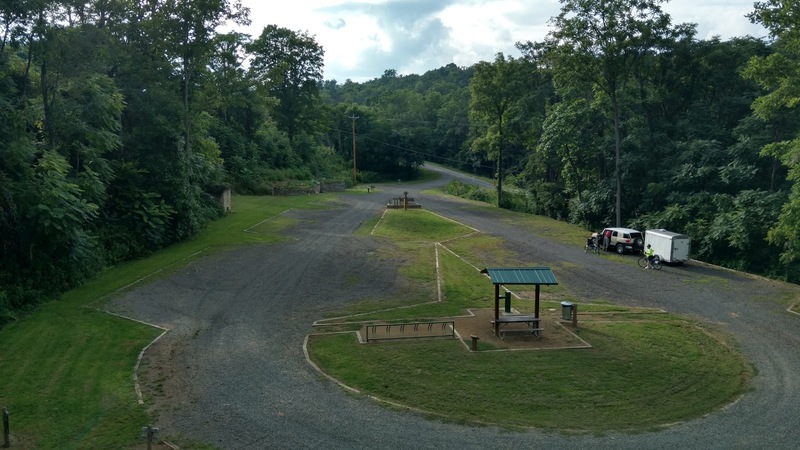 About 8:30 AM, Daniel dropped me off in Fries, VA, at one end of the New River Trail. I headed north back to Ivanhoe along the trail. I ended up with 12.5 working miles and 13.1 miles overall. It was a beautiful run and I enjoyed it quite a bit. 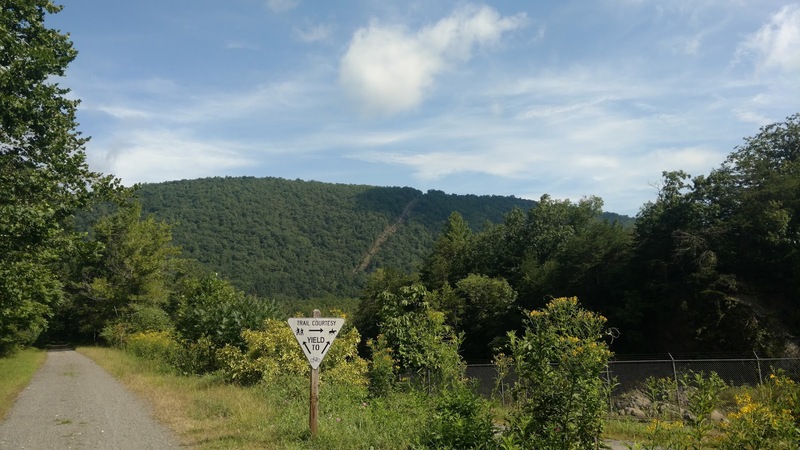 For a recap of my run with lots of pictures, please go to my running blog and check out the New River Trail - Fries to Ivanhoe post. One of the views along my run. After my run, I showered (boy, I'm spoiled!) and sat around chatting with Joe and Daniel until we ate lunch. I was being lazy and finally managed to go to registration. I had already sent in my pre-entry and a deposit, but I had to show Sasha's coggins papers and pay the balance before getting a map, crew directions for the away vet check, a schedule of events and the ever important ride card. Next came the vet in. I got Sasha and took her up to vet in. She was good to go with a 36 pulse, but A- on Skin Tenting. She'd been drinking well and eating. She's gotten comments on her skin tenting before, so I'm starting to think this is just her, like Tanna's quieter gut sounds almost always get a B (back before they started using that +/- quadrant stuff). Playing in the water after vet in. We should have done this after the ride, but didn't have time. After supper, we went to the ride meeting. Pulse 64, holds 38 minutes and 120 seconds (Ask Dr. Nick about that one...) and of course tack off at the vet checks. It was scheduled to be in the upper 80s, so tack off was definitely on the agenda for me. Unless it's really really really cold (which for me and my horses is about 50°), I tend to pull tack anyway to give the horse a good break and the vets a good look at the entire horse without being hampered by the saddle. The description of the trail marking was scary. Go for 2 miles following orange ribbons, then switch to orange diamonds, then orange ribbons, then blue diamonds, then orange blocks of signs. The 2nd loop was even worse with changing back and forth between Yellow ribbon and orange diamonds and blue diamonds and back again! The map. The scary directions are on the back. But honestly, the trail was marked beautifully and every time we changed what color or signage we were following, there was a sign that clearly stated our next section. I never ever pulled out my map the entire day or questioned whether I was on the correct trail. Very well done. After ride meeting and chores, I went to bed. Around 2 AM, Daniel nudged me and said, horses loose. I was up on my feet standing in the middle of the living quarters in a heartbeat. I shoved my feet into my shoes and out the door with Daniel right behind me. Sasha was standing on her high-tie fine. Joe's horses were standing in their pen. But sure enough, running hoof beats told the story of multiple loose horses. I headed after one of them who was soon caught. The horse had a halter, but the lady holding him didn't have a lead rope, so I ran back to my trailer to get a lead rope. By the time I got back, the lady was holding TWO horses. But the owner of the first horse came and claimed him, so my lead rope went to the second horse. That horse was reunited with its owner and I headed in a different direction to see if I could help find the third horse I knew was loose. Soon that horse was also returned to its owner and things began to die down. Whew. What excitement! Back to bed for another couple hours of sleep before the 7:00 AM start. Sasha saddled and ready for the start. 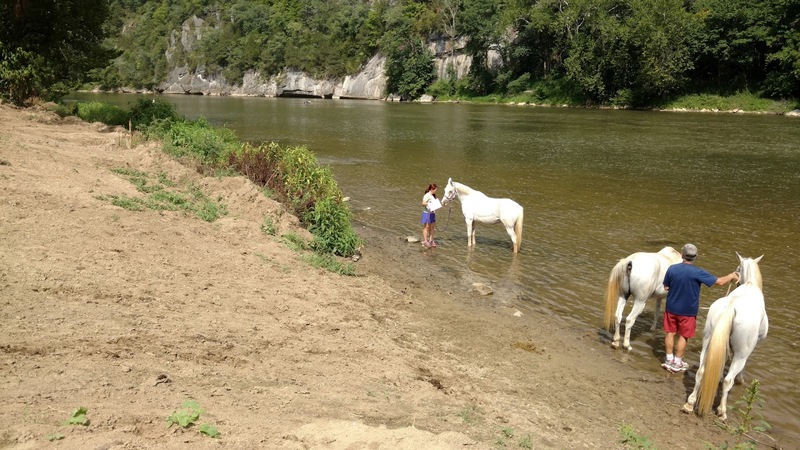 Joe and I found a spot to start our two horses. We were concerned about narrow switchbacks a couple miles from camp. We were both worried our horses would do something stupid and we hoped to get into a group of people that would be sensible and be able to handle tense situations. As it turned out, we ended up attacking that switchback by ourselves. I sent Sasha ahead simply because that's where I was and we walked the narrow trail. 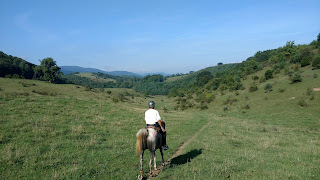 Joe's horse, Friday, was a little distracted and that was a bit scary, but Sasha behaved herself beautifully and Friday never actually did anything bad and we found ourselves through the scary spot and onto the hills. Before the switchback, Sasha was very elevated. She was having a little come-apart because I wouldn't let her run, but it was a very controlled and contained come-apart. The hills quickly settled her into working mode. The first loop went quickly for me as I chatted with Joe. Soon we were in cow pastures. 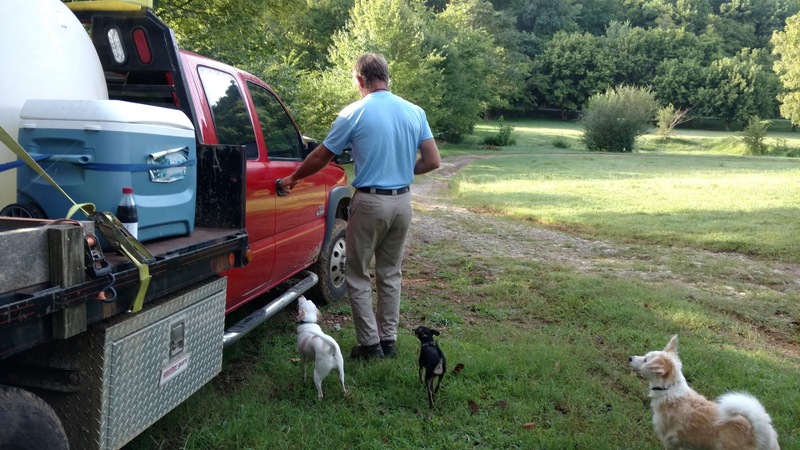 I was interested to see how that would go since Sasha and I have been working on her courage around cows. It went beautifully! Sasha definitely looked, but no come apart moments. I'm sure it helped that Friday was there as well. One of the gorgeous views in the range. After the cow pasture, we had a beautiful little trot through a covered lane and then out into Triple C, the location of the vet check. The loop had taken us just over 2 hours 30 minutes. So a little longer than I had hoped. I spotted Daniel quickly and headed to our pop up tent beautifully laid out with chairs and fans, hay and feed and saddle racks and filled water buckets with sponges. Daniel is a great crew!! We stripped the tack and headed for the vets. Sasha got distracted by something and began to spin and holler. It took her a few minutes to calm down to get her pulse read so I could vet her in. Brat. She settled quickly and vetted in well. Daniel holding the horses during the hold. Very good crew! Back to the tent to spend the rest of our 38 minutes, 120 seconds hold time. Sasha ate a lot. All of her mash and I ended up giving her some more, then she ate a good amount of hay. I managed to eat a half peanut butter and jelly sandwich. Before I knew it, it was time to saddle up again. We went out on the second loop 6 minutes late. My fault. I always seem to have trouble getting out at my out time. This was a long long long loop. I had never done this loop and wasn't sure what to expect. The first 5 miles were great. We were moving right along and making good time. It was beautiful and Sasha was in full work mode. Point her in the right direction and just chill. 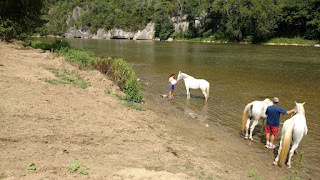 We came out into a horse camp and we walked through it so as not to disturb the campers, then picked up a trot again. Until we came to THE HILL. Well, the first hill, but boy was this a doozy!! Joe dismounted first and then I did when he said the hill went on aways. 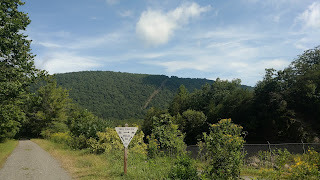 1.5 miles and about 1250 feet of climb. That's about a 15.75% grade for 1.5 miles. I was one tired puppy when I finally climbed back on my horse. At least it was a gravel road and not a rooty, rocky, uneven trail. Believe it or not, this was the best view I could find from walking up that long long hill. It was definitely the right move to give the horses that break and walk that hill on our own two feet. They were willing to move out when the footing was good. We were conservative, but moved out when we could. The day was getting hotter, so we used the shade and got out of the sun as soon as possible without being stupid. We didn't want our horses' temperatures to get too high. Both horses did some good breathing, but both would still their breathing after a minute or two rest, so I wasn't too concerned. After the first big hill, the going was slow and about 10 or 11 miles in, Sasha hit her big mental block. We do a lot of out and back training rides simply because I have to. So Sasha expects us to turn for "home" after 7-8 miles, 10 at the longest. Her work ethic still remained, but her chosen direction (back the way we came) was different than mine (forward around the loop). When she does this on shorter loops, she soon gets the idea that we're headed toward where she wants to go after all and the direction fight ends after just a couple miles. But on such a long loop with no indication that we were getting closer to HER destination, she often tried to change directions at a water stop or a grass stop. Very frustrating for both of us. About 3/4 through that loop, we came on the best sight. 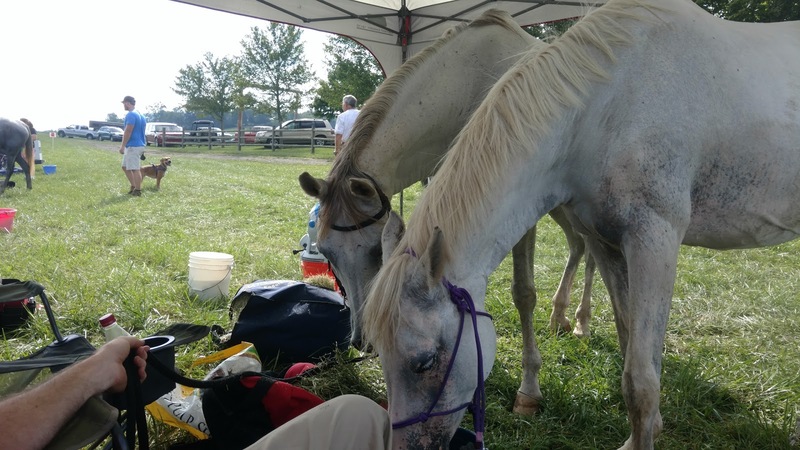 An amazing group of volunteers that had watermelon and refilled our water bottles with COLD water and fed our horses carrots and a full water trough. All in the shade. It was amazing. We stayed about 10 minutes. In hindsight, I wish I'd gotten off her, but I honestly didn't know they were going to be there or that we'd stay that long. So next time I'll hop off the second I get to that spot to make the most of that resting place. We took off again and soon we were in two-way traffic with the top ten 50 milers going out on their last loop headed back to camp. Even though we didn't go the same direction as those riders, Sasha all the sudden decided I was right and this was the direction to go and we were on the same page again. So much easier to ride her without having to watch for sneak direction changes! We dismounted at the bottom of the hill below the vet check and hand walked them in. I was in some serious pain. All that water need a new home! Not pleasant to trot or walk! I got my in time, pulled Sasha's saddle and zipped to the nearest porta potty. When Dr. Kay checked Sasha, I told her I was worried about Sasha's muscles. She asked why. I told her a reluctance to trot downhill. I thought it was more a motivational thing as she didn't start being slightly hesitant to go downhill (she would try to turn around instead) until she decided we were going the wrong way, but this is a tough ride with lots of elevation changes, so I wanted the vet to look. Dr. Kay was great and paid special attention to her gait and her muscling. 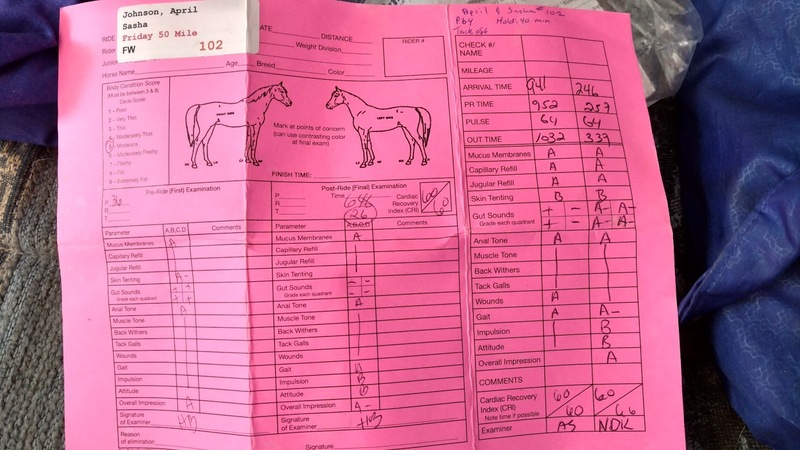 She gave Sasha a B on impulsion and attitude, but couldn't find anything to indicate muscle issues. She advised to go careful and hop off on the downhills if I still felt there was a problem. We had the perfect vet check set up! 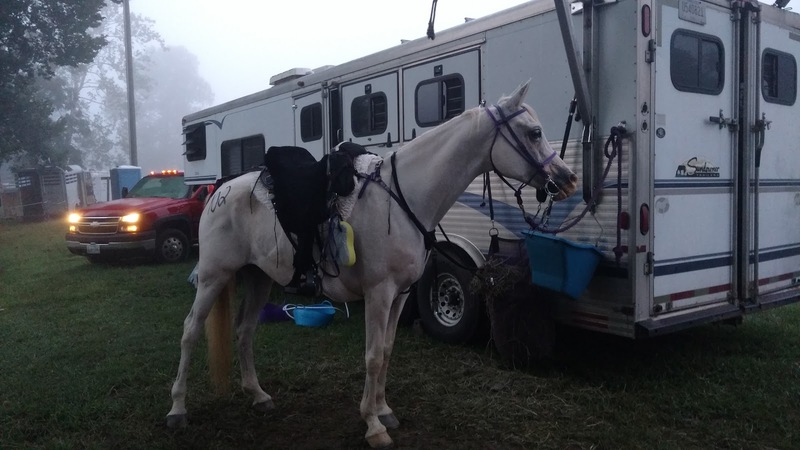 The rest of the hold sped by with me swapping the dirty saddle pad for a fresh clean one, packing things up, as much as I thought I could and cramming another peanut butter and jelly sandwich down my throat. This time we went out 3 minutes past our out time. So we lost 9 total minutes from me being late on the out time. Normally this isn't a big deal and I still didn't think it was a problem. We had 3 hours and 20 minutes to make the return trip to camp. We had done the first loop in 2 hours 40 minutes, so I thought we had plenty of time. Snap! Nancy Sluys horse. I used to own Snap. These two have never shared a pasture, but Sasha is in love with him anyway. A couple miles out, we hit another hard climb, so Joe and I dismounted again. This time there was lots of rock. Joe led Friday and I grabbed Friday's tail to help me keep up. Sasha brought up the rear and we made a weird little train up the hill for a good mile. I was very thankful for Friday's help up that hill and felt a little bad that Joe wasn't tailing his own horse. I've got to work on Sasha's tailing skills. We finally got back on and came to a spring fed water trough. Friday drank deeply, but Sasha just played with it. I made sure she wasn't holding electrolytes, but she still didn't drink. I sponged her and we moved on. I didn't get off again for the rest of the ride. I was done walking. The terrain opened up enough for some trotting between climbing stretches, so on we went until we finally crested the top and began the gradual descent back into camp for the last 8 miles. We trotted a good many places maybe we would have walked if we'd had more time. But the mile long climb at the beginning of the loop ate up a LOT of time. We reached the water trough at Highway 94 and I was hoping Sasha would drink, but the water was hot and she refused to drink it so after a couple minutes, we crossed the road and moved on. After the rocky section, the trail opened up to the rolling curves that are my favorite part of the entire ride. Friday had kicked his trot into high gear. Friday is over 16 hands tall and Sasha is about 14.2. This means his legs are longer and he can trot a lot faster than Sasha. I decided I didn't want her extending the trot for that long to keep up and I didn't want to canter her too much either. So Joe agreed to rock on and I'd either catch him on a walking stretch or I'd see him back at camp. Eventually, I did catch back up with him and we entered the switchback area together. Joe decided to dismount and walk down, but I stayed mounted and we traversed the trail without incident. Sasha still wouldn't drink out of the creek below, but I sponged a little and we headed back to camp. I glanced at the time and realized we had only 20 minutes to complete! We were just under a mile from camp. I let Sasha move into a nice controlled canter and ate up a bit of that in quick measure. We trotted until we saw the finish line and then cantered in, Joe, then me. Ten hours, 26 minutes ride time. We only had 14 minutes to spare before we would have been overtime. See how much the 9 minutes I wasted at the vet checks might have cost us? When I'm running on the edge, it's important to get out at my out time. It worked out ok, but this was close. Not my closest, but definitely close. Daniel had the truck near the vet area, so we stripped the horses and went to sponge them, but found the water was quite warm. Too warm to do any good. We checked the nearby water troughs, but same story. Daniel grabbed our cooler and dumped ice into our water buckets to cool the water and we were able to use that to get the horses down. I had forgotten to get my stethoscope, but it was easy enough to feel Sasha's pulse with my fingers behind her elbow, so could tell she was down. Friday was down also, so we went to vet in. 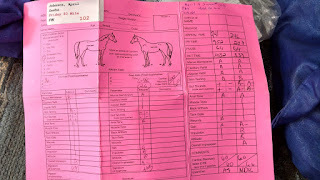 Again, Sasha got Bs for impulsion and attitude and her guts were quiet on all 4 quadrants. I figured her guts might be a little quiet since she didn't drink well until the water trough just after the finish line and there hadn't been enough time for that to affect her gut sounds. The impulsion and attitude. I think she may be starting to relax in vet checks and just not waste energy. Tanna does that very well. So well, he looks like he might not should be ridden, but he's just conserving energy and thinks the trot out is a waste of energy. But I'll keep an eye on it. I put Sasha back on her high tie, gave her feed, hay and put her compression socks on. I use EquiCrown compression socks. I've tried other, cheaper solutions that seem to work well for some horses, but these socks work amazingly well for both my horses and I don't have to do standing wraps. I can still feel the leg and it's easy to whip off the socks if I need to. Bonus is both my horses wear the same size, so while I have a full set for each of them in their color (black for Tanna, purple for Sasha), I can mix and match if I need to. Sasha back at the trailer immediately after the ride before I got her dinner and put her compression socks on. Our completion award was our picture from Becky Pearman, who takes the most wonderful ride photos! I love this year's picture! Sorry, I don't have the digital version and I know photographers hate pictures of their pictures. Never does the original justice. After the ride meeting and awards, I walked Sasha for a good bit, watching her move and asking her to trot. She trotted immediately without any further asking. That was very telling to me. If she's a bit tired or sore or sour, she won't trot right away. She'll drag and say, do I have to? But she did it immediately and looked very good. She was over-striding like normal, showing me she had no stiffness in her rear end or pain in her hocks. A soft, kind eye. I walked her before bed and again around 2 AM. She was energetic and bright and quite bouncy. A little fill in the legs from standing around, but that went away after walking for a minute or two. Super pleased with how well Sasha handled that 50! It was tough. It was hot. It was humid. There was a lot of elevation change; some 8000 feet over the 50. That's a lot for my little horse. We don't have mountains to train on around Nashville. Sasha's work ethic was great! I never had to push her or haze her or even ask twice for a trot. One issue was the struggle of wills in the middle of the 2nd loop to keep her moving the direction I wanted. The other issue was her not drinking much on that 3rd loop. She did drink some out of a water trough, but I would have preferred a lot more. Thanks to Nancy Sluys and team for a well run ride. I couldn't be happier with how it turned out for us.